alaTest a collecté et analysé 21 avis de consommateurs et d'experts pour le produit Mr. Coffee Coffeemaker with Grinder and Accessory Pack. La note moyenne du produit est 4.6 sur 5, tandis que les autres produits de même catégorie ont une note moyenne de 4.2 sur 5. Les testeurs apprécient l'ergonomie. Le design impressionne, mais les auteurs d'avis ont des doutes sur la qualité de construction. 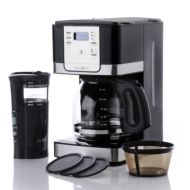 Après analyse des notes de consommateurs et d'experts, de l'âge du produit ainsi que d'autres facteurs, et comparé aux autres produits de même catégorie, le Mr. Coffee Coffeemaker with Grinder and Accessory Pack obtient un alaScore™ de 82/100 = Très Bien. The coffeemaker is exceptional and I am very pleased with my purchase. The bonus items were a plus that made the purchase a win win ..
Not only do I love the machine makes great coffeebut the grinder is great too. It's everything the video said it was.. I purchased this coffeemaker right before Christmas and am very pleased with it. It was very easy to set up and makes delicious coffee. The coffee grinder is a great added bonus & is a great incentive to always use fresh ground beans. Great value! This coffee maker and grinder are perfect! easy to use and clean and makes a great cup of joe. Hsn is great, my coffemaker arrived fast and works great. I love it and use it everyday.